Karameller, meaning ‘hard candy’ in Swedish, is a modernist interpretation of a traditional candy shop that specializes in high quality sweets from Scandinavia. 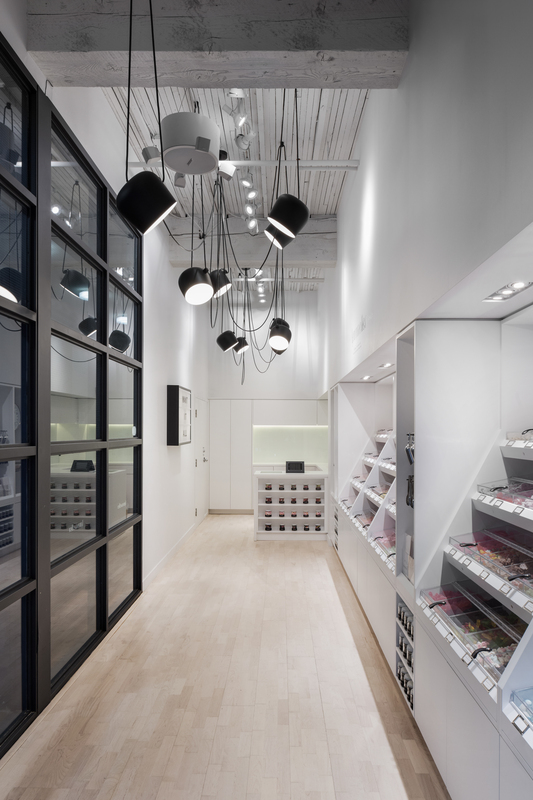 Driven by the attention to detail that is commonly found in contemporary Scandinavian design, the shop’s long and narrow floor plan and all white interiors give focus to the colourful candy display. The long bank of custom casework is the singular design feature in the space. With a focus on high performance lighting and minimalist design, the architecture is intended to interpret the compartmental design of traditional apothecaries and is inspired by the medicinal assemblage of Damien Hirst’s installation Pharmacy. One singular element is articulated to provide all the necessary products and equipment for the daily operation of the self-serve retail operation – vessels, tongs, scoops, weigh scales, point-of-purchase equipment, cleaning equipment, and work surfaces.